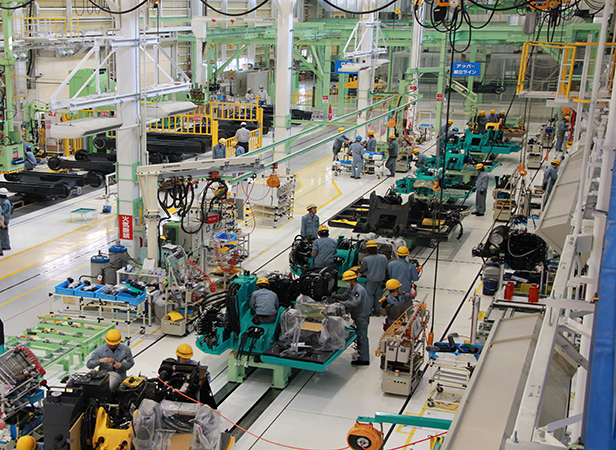 Manufacturing - Kobelco Construction Machinery Europe B.V.
base for Kobelco machines used throughout the world. This plant made strides in drastically changing its business environment and manufacturing. One example of this change was the start of the improvement initiative "K30D" which had a goal to increase productivity by 30%. In this initiative, a production line that could be "comfortable" and "enjoyable" was devised based on input from frequent discussions held day and night with staff and factory workers themselves. The "improvements to unify the factory floor" where manufacturing starts, proved quite successful. Production became more efficient, with improvements to safety and quality. 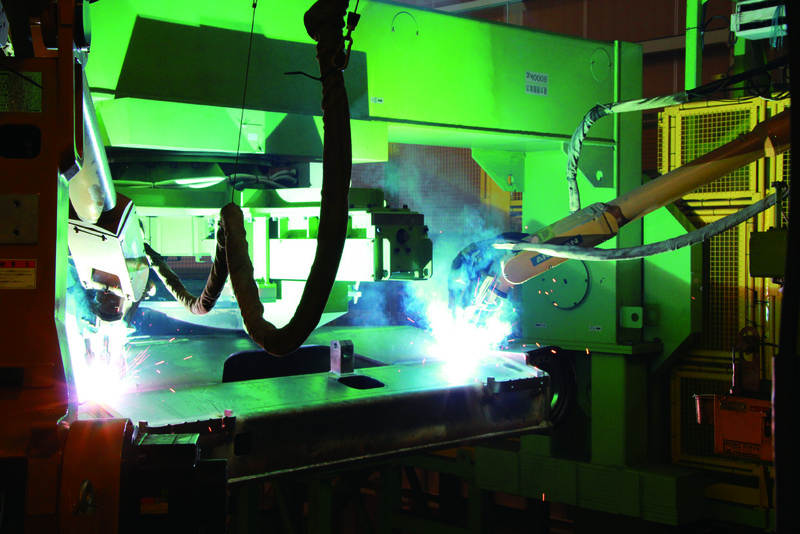 We've introduced state-of-the-art robotic welding and machining tools in our production facilities throughout Japan and overseas. However, we also promote "Improvements in mechanical devices", i.e., non-electric applications using the principles of levers and gears. Kobelco Construction Machinery believes that being able to strike a good balance between manufacturing that makes the best use of the latest machines, and people with expertise, brings great flexibility and high productivity. To provide customers with higher quality products, Kobelco Construction Machinery has established a complete quality control system in which materials and supply parts are inspected and each step of the manufacturing process is tested to arrive at a finished product. Not only do we use all of our inspection equipment and devices in each inspection process, but we work in conjunction with QC circle activities and other worker activities. Learning from each other: in pursuit of high quality together. We promote a system that allows us to manufacture the same high quality products under the "Made by Kobelco" brand anywhere in the world. One part of this system is an annual conference on quality. In this conference, supervisors gather from domestic and overseas factories to discuss issues and goals, share success stories and help with the training of talented individuals from all over the world in the importance of a consistent understanding of quality.